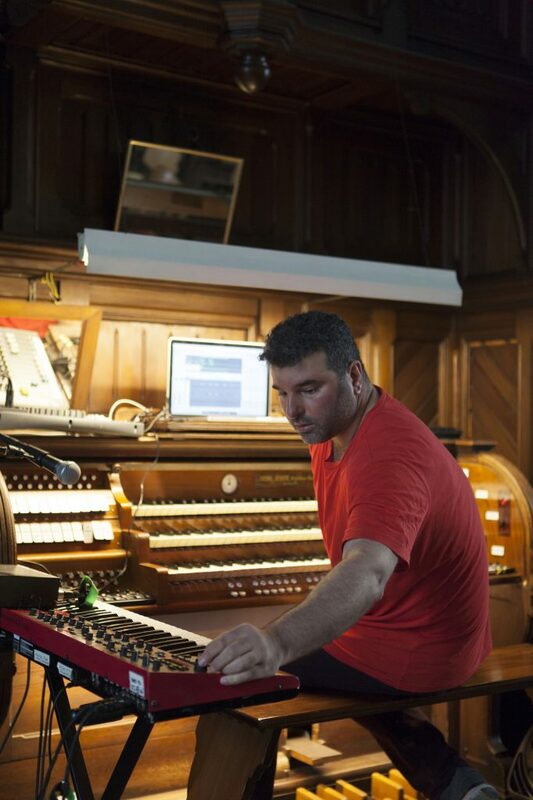 Composer, free improviser, classical pianist, electronic musician, Canadian, Berliner, expat – John Kameel Farah grapples with a multitude of identities. 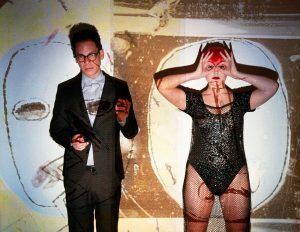 Speaking with John, we map a Venn diagram of both the man and his art, which these days manifests as concerts of spatial organ and synthesizer music. 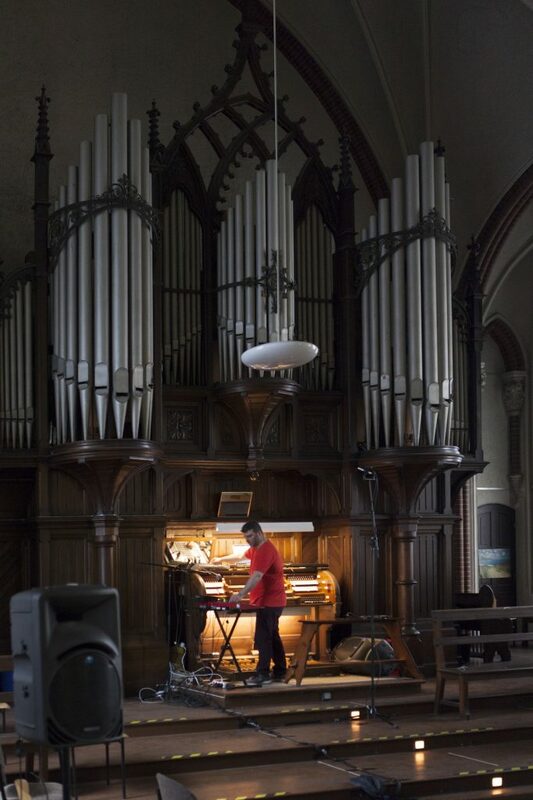 A curious mixture of analogue organ tones, textural synth loops, highly technical pre-composed scores, and wildly expressive improvisations, this is the sound of history turning futuristic and frequencies colliding in the apse of Kreuzberg’s Taborkirche. We meet John Kameel Farah in his local bakery, heavy spring rain clouds gathering outside. As fellow expats, there is a certain ease to our conversation; the foreign made familiar, shared cultural norms – or at least the perceptions of them. As John speaks, vowel sounds turn elastic in his Canadian accent and we get the sense that he is pressing ‘unmute’ on an internal dialogue, sharing soundbites of the thoughts and ideas that run in an endless, evolving loop through his mind. He pauses halfway through wayward sentences and lands suddenly at the start of new ones, leaving the old ideas unfinished. After decades in Toronto as a fixture of the free improvisation scene, John moved to Berlin in 2010. “Berlin has these certain advantages: the artistic open-mindedness and hunger that people here have, for example,” he says. “I know that Berlin is more than 800 years old, but you don’t feel that. You feel the last hundred years when you’re here.” Nevertheless, he is adamant on giving credit to the nurturing environment where his career began. “The musicians in Toronto are as good as anywhere in the world in jazz, indie rock, electronic music, classical. The problem is that the population of Toronto wants to be more comfortable. 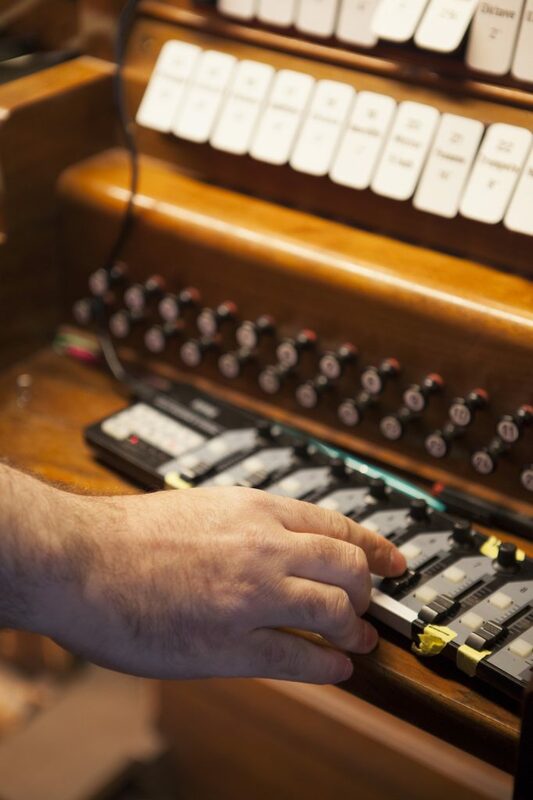 Here, you have a much more active population.” And Berlin’s enthusiastic concert- going public has been stalwart ever since John launched his most recent project: a series of concerts for organ and synthesizers, usually held in Kreuzberg’s Taborkirche. This unease with the constraints of operating in the classical music strata extends to how John feels about musical prescriptivity. 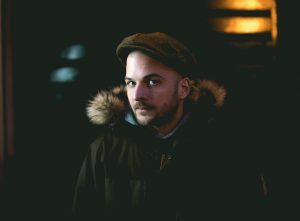 He loathes being labeled ‘world music’, despite growing up in a Palestinian–Canadian household that exposed him to Arabic music and endowed him with a curiosity for its non-uniform rhythms and modal scales. Equally so, he doesn’t want his inclusion of Baroque influences to be read as simply ‘Bach with a twist’. When John describes his areas of interest, one senses an attentiveness that makes him patient enough to take an almost child-like joy in discovering the possibilities of his work as a musician and improviser. “If my mind is like a workplace, it’s a completely filled-up studio with little bits, gadgets, and things that have been stuck together,” he says wryly. In this giant mental workroom, ideas don’t compete for attention, but are simply set down and picked up amongst an array of eye-catching baubles. “It’s my own way of being a science fiction writer, of trying to project either where I think things are going, where I want things to go, or where I don’t; dystopias, utopias…” John trails off. His imaginative musings could come across as absent minded, but rather it seems that his inner world is so rich and colourful that the external world must struggle to keep up. Classical music looms large among the collection of influences that have captured John’s attention, strengthened by a fascination with his adopted country’s saturated history. “Musically speaking, you have several major Amazonian rivers running through Germany: Baroque, Romantic, post -war serialists. The German Romantic period is this gigantic, bloated monster to me. Everything is gorged in sound, orchestration, theme – washing around like a massive thing from Revelations,” he enthuses. But two world wars left their mark. 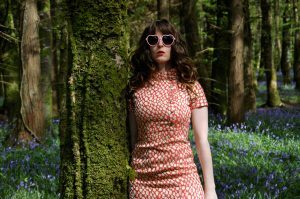 The population was exhausted by years of warfare, disillusioned with turn-of-the-century optimism, and swallowed up by dictatorship, and music took a similarly abrupt turn in unimaginable directions. John describes the 20th-century shift towards “super concise, streamlined, minimalistic, futuristic, bleak” music: “There are these threads, and I’m living in all of those things. They’re all relevant to me.” Despite that, his universe isn’t populated with black holes and dying stars. The heart of his outlook is creation and generation, building strands of musical DNA and watching how they twist around one another. 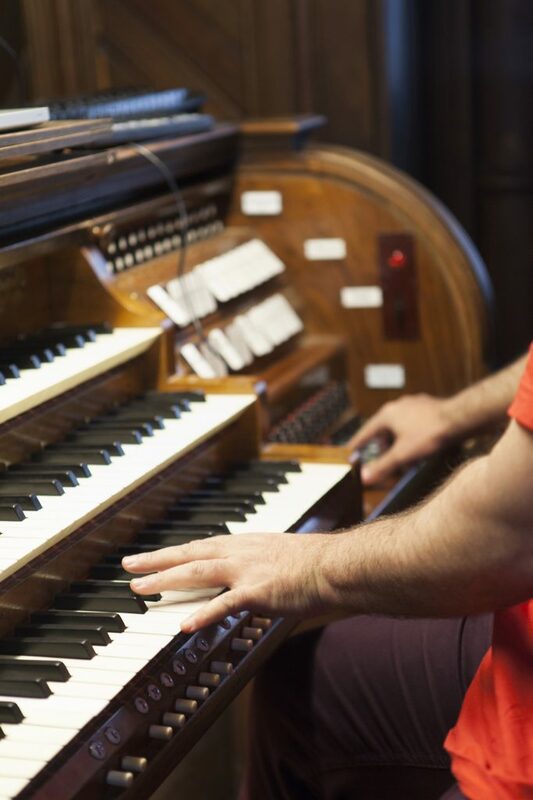 The intertwining that is on display in John’s organ and synthesizer concerts has partial origins in his time as an undergraduate at the University of Toronto, where he was exposed to electronic music by his roommate. 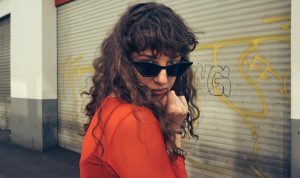 “I wanted to use the textures and beats that I was hearing in electronic music, and I thought it would be amazing if I could use them with complicated rhythmic structures that you would find in Bartók or Prokofiev. I wanted to create pieces that are structurally deep – not dance tracks, but composed pieces,” he explains. 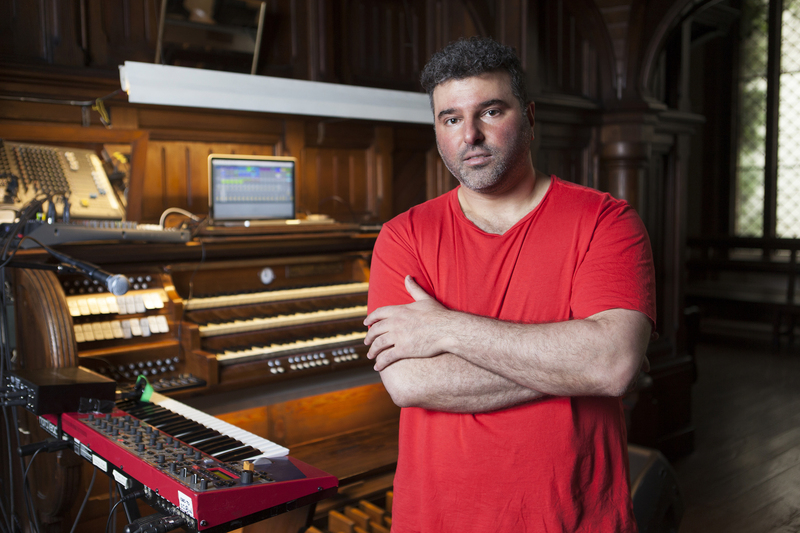 His piano music – which he describes as “maximalist” – has benefitted from this for years, but now John has found another bridge between his classical and electronic modes. 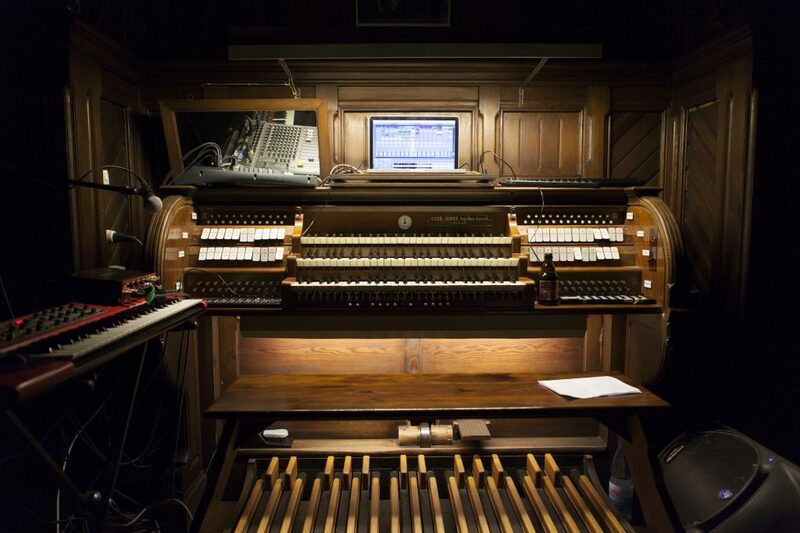 “Organs are ancient synthesizers. 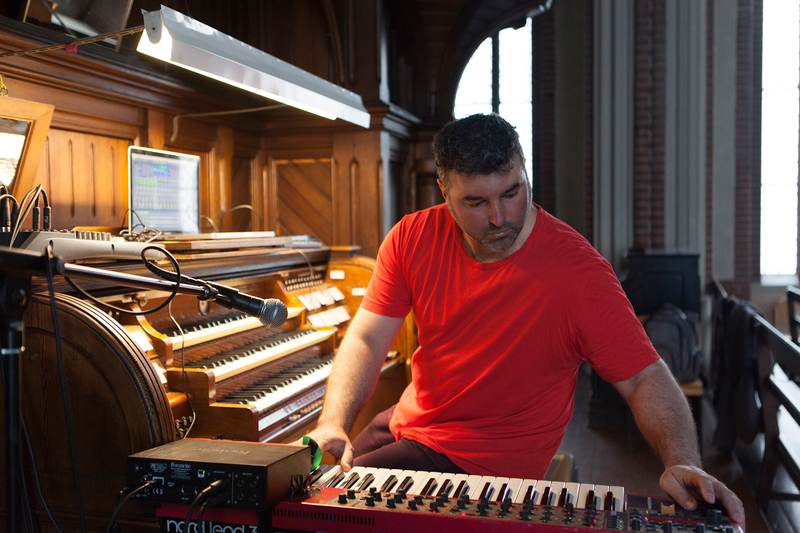 Instead of twiddling knobs and faders, you’re pulling stops, or different combinations of stops together, to get different effects.” The complex potential of this instrument drew John and his music into a new realm of composition, improvisation, and performance. Meanwhile, his synthesizer experiments found fertile musical material: “Looping offers spontaneity, the chance to make up something on the spot and create a texture of many sounds that are orbiting each other. The pieces are like free-floating meteorites.” The vaulted ceilings and reverberant acoustics of the Taborkirche also lend a powerful emotional component to his concerts that John relishes. “I wanted to provide an opportunity to ‘ponder infinity’, and churches are meant for that kind of thing,” he remarks. Pondering infinity or not, John’s concerts are an atypical experience for the average Berlin club goer or electronic music devotee. I wanted to provide an opportunity to 'ponder infinity', and churches are meant for that kind of thing. More than six years into life in Berlin, he is reluctant to give trite, recycled opinions on life in Germany’s capital, but he admits to noticing a stratification of Kieze and lifestyles. “There are these two halves of Berlin, beyond East and West. There are two sides that don’t know each other; which are the institutional, Museumsinsel side, and the chaotic, Neukölln-ish side with its mixture of different ethnicities,” says John, speaking with jaded know- how. “They feel unaware of each other. One side is breathing and present; the other is there to preserve, to be institutional reminders or repositories for the continuum of civilisation, for the canon.” As a self-professed ‘armchair historian’ with a passion for the past, John’s comments don’t belie any sarcasm, to which he seems impervious anyway. Even when making observations about Berlin’s social mechanisms, there is a preoccupation to his manner, a sense that he is interested in dialogue but that his mental energies are resolutely in pursuit of other creative ideas. John speaks in the present tense more often than not, imbuing his storytelling with a sense of timelessness as he spins out elaborately imagined dialogues between himself and ‘proper’ organists, for example. John launches his new album Fantasy & Fugue on September 15 at Roter Salon. Keep up to date with his future performances and releases on his website.